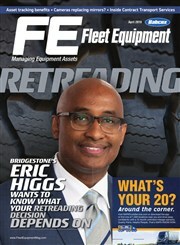 Technology has made keeping track of your fleet operation and the assets they carry an important business advantage. During this free webinar on Wednesday, November 14, Fleet Equipment senior editor Alex Crissey and Robert Vacheron, senior director of product management, IoT services with Sierra Wireless, will discuss how companies can take advantage of advanced tracking technology to track their fleets and high value assets, and how it can help them improve ROI, streamline efficiencies, and reduce costs. Inefficient procedures that waste time can severely impact any organization. Join us to hear Jason Morgan from Fleet Equipment Magazine, and Ryan Driscoll from GPS Insight discuss how inefficient maintenance, vehicle utilization, and fuel usage impacts organizations, and the different types of data and technology leveraged to overcome these challenges. What's the Right Oil Drain Interval For My Fleet? It's tempting for fleets to consider extending their oil drain intervals beyond the manufacturer's recommendations, since changing the oil less frequently saves time and money. However, the consequences of choosing the wrong oil service intervals can be catastrophic and costly. You could shorten the engine's life or suffer unscheduled downtime, negating any savings in the long term. Attend this free webinar to hear a live discussion between Fleet Equipment editor Jason Morgan and Mark Betner of CITGO to learn about the best oil drain interval for your fleet. It's vital to keep your fleet up and running, safe and compliant, and backed by a shop that’s efficient and cost-effective. Join our panel of experts for a free Fleet Equipment webinar designed to demystify the maintenance software buying and go-live experience. During this webinar we will examine five critical milestones, as well as unique goals, objectives and lessons learned for each step of the process. Improvements in fleet maintenance tools and procedures are benefiting small and medium fleets every day -- by enabling them to make better decisions and improve uptime and safety. During this free webinar, learn how you can make better, real-time decisions about the health and safety of the vehicles in your fleet. Attend this free webinar to hear a discussion about in-cab video between Fleet Equipment editor Jason Morgan and Drew Schimelpfenig of Omnitracs' Safety Center of Excellence. You'll learn from a safety expert about the ins and outs of in-cab video -- and how this tool can be your fleet's "silent witness" in the event of an accident. Register now! Sponsored by Omnitracs. Keeping Your Fleet Powered Up: Is Solar a Good Option? During this free webinar we'll talk about solar's increasing role in powering the modern fleet. Can the sun really keep your lift gates powered during peak delivery times, and your interior trailer lights on for your entire route? Hear Kirk Rhoades at GPS Insight discuss the best practices for a successful Electronic Logging Devices rollout, and why now is the time to implement a solution to ensure you are compliant by the December 18, 2017 deadline. Lower fuel costs, increased efficiency, and better driver safety are just three of the many reasons to fully embrace an ELD solution. During this webinar you'll hear how Richard Carrier Trucking's fleet is using an ELD solution to drive efficiency gains, boost driver morale, and improve safety. In December 2016 you'll have new choices for your fleet's engine oil. Two new categories of heavy duty oil will deliver increased fuel efficiency, reduced downtime, and less engine wear. During this free Fleet Equipment webinar, learn about the benefits a Georgia trucking company has achieved in its testing. Presenters will also answer your questions about these new oils. Around 3.1 million vehicles will be required to comply with the government’s new electronic logging device (ELD) regulations. You need to begin preparing now. During this free on-demand webinar, you’ll learn about the final ELD rule and how it impacts your fleet. The webinar presenter will answer your questions about the new laws, ELD technology, and what the final ruling means for your business.